Well, I’m still a bit bitter that this turned out to be the 3rd of 4 books rather than the final leg of a trilogy…but I loved it. The characters are more complex than ever, and the plot thickens (to use some perfectly cliche phrases). Seriously though, it’s a really good read. The novel delves deeper into interracial politics, but also gets into some pretty sticky philosophical issues only briefly touched on in the previous 2 novels, such as religion and identity.While some of the earlier plot threads are finally addressed here, and Paolini gives the reader some satisfying answers, the novel still left me wanting more. What exactly do I want? An ending, damn it! I purposely put off reading Eldest in order to wait for the trilogy’s completion so I could read all 3 at once. 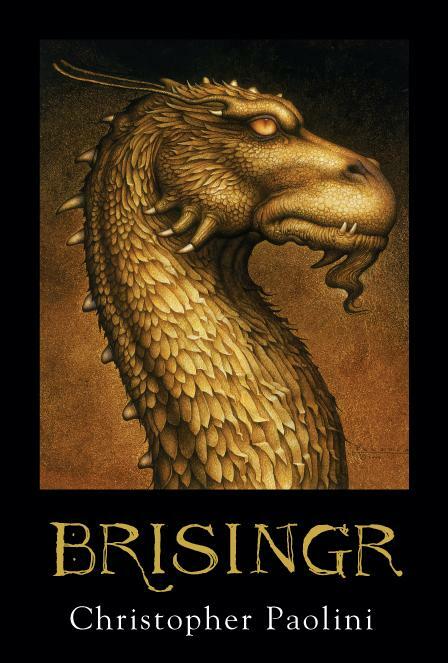 Boy am I glad I had so much going on that I wasn’t able to get to it until 2 years after Brisingr was published — at least now, I know the book should be coming out within the next year or so. Hopefully.I’m still interested in what Paolini’s doing with the shifting focalization — although I can’t say I’m terribly pleased with how he represented the dragons’ minds. Dragons are supposed to be hyper-intelligent and regal and this amazing ancient race, but Saphira’s thoughts sound like a sophisticated imitation of the way Native Americans were represented in Westerns from the earlier half of the 20th century, complete with broken English, romantically simplified methods for naming things, and little to no indication of the intelligent thought and complex reasoning skills Saphira demonstrates in conversations where the reader is not privy to her naked consciousness. While Paolini didn’t exactly botch it, I think he missed a great opportunity to do something more original than this, and it seems inorganic to the other work he’s done to illustrate just how noble and intelligent the dragons are (outside of their own heads, apparently).Anyway, griping aside, this was a fantastic read. Very interesting, compelling, and inventive (which is not surprising, given the nature of Eragon and Eldest). I’d recommend this book to anyone looking for a good read…but would also recommend you wait until the 4th book is released so you won’t have to reread the entire series next year (or whenever).